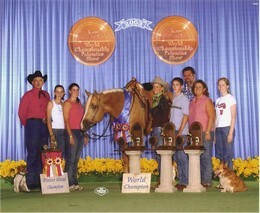 Winner of WP, English & Trail classes in PHBA & AQHA. Championships, Color & Halter. World Champion in HUS, Trail & Road Hack 2003 PHBA World. Reserve in NSBA HUS. Reserve Aged Stallion in Halter, 4th Jr. Western Pl.7th in NSBA Western Pl. Stakes & 5th in Color. All Arounds in AQHA.